What a beautiful day! Our passage-mode mentality worked in our favor today as we used the available weather information to pick the perfect day for our move from Eel Pond in Woods Hole to the Brewer Fiddler’s Cove Marina in Megansett Bay on the east side of Buzzard’s Bay. ‘Perfect’ meant no wind, so there was no sailing, but we were able to easily get off the dock in Eel Pond and move easily into the slip at Fiddler’s Cove. The ‘drama’ was going aground in the entrance to Fiddler’s Cove. We were up early and Chad and Victoria, the young couple living aboard at Wood’s Hole Marine, came out to help us get off the dock. With no wind and virtually no current, it was an easy task. We then went out into Eel Pond and picked up a mooring to wait until the 10 am opening of the bridge. We hooked up a hose to our aft head sink and cleaned all the bird poo off the boat. We thought we were free of the birds once leaving the dock, but when I went back out on deck when we were leaving the pond, I found the birds had already returned and left their fresh markings on our sparkling clean boat. We had three knots of current with us in the ‘hole’ as we traveled from Vineyard Sound to Buzzard’s Bay and then we motored ever so slowly northward. Buzzard’s Bay was absolutely glassy so we took advantage of the situation and recalibrated the wind indicator. That simply required that we turn circles in the water and then align our direction with the direction of the wind. There was not a cloud in the sky and it was so warm that we didn’t even need to wear jackets. We knew that low tide at Fiddler’s Cove was supposed to be at 11:30 am, so we had planned on waiting until 2:30 pm to enter the cove. But as we approached Menahaut Bay around 1:30 pm we decided to go in. We knew we were taking a chance of going aground in the entrance to the marina, but the folks at the marina said they thought we would be fine. Well, we weren’t. We started through the entrance with 2.3 meters of water, but that quickly went to 2.2, 2.1, and then a jump to 1.9. Thump. We were aground. Heather had called earlier and said that she would bring Sam and Jonah to watch us bring Windbird into her new home. And there they were on the dock watching as we came to a standstill. The marina folks immediately saw the problem and sent a boat out to try and pull us in. The first boat got the tow rope caught in their propeller and sheared a pin, so they went back to get a bigger boat. All I could think was, “Where is Survivor when you need them?” The only time we went aground while circumnavigating was in the southern Cook Islands. Lucky for us, Survivor was there filming an adventure and they sent two huge rubber dinghies, each with two 200 HP motors out to rescue us. Today after the first boat sheared a pin, the marina sent a larger boat with one 200 HP motor and it was able to pull us through the pass. Heather, Sam, and Jonah were there on the dock cheering for us when we got in. 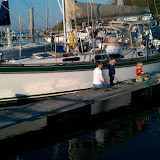 Once we were tied securely to the dock, we then spent the next couple of hours playing in the sunshine. The boys each had a net that they used to try and catch small fish. They didn’t catch fish, but they did catch seaweed and they enjoyed trying to burst the bladders of the knotted wrack and rock weed that floated by and got caught in their nets. It was such a beautiful day, a true gift from Mother Nature, and the boys just enjoyed laying on their tummies on the dock with their nets. We walked along the shoreline and just luxuriated in the warmth of the sun. We fed Cheerios to the healthiest and most beautiful Mallard ducks any of us had ever seen. We just truly enjoyed the afternoon. The boys didn’t get a proper nap, but they did get to enjoy a rare, warm November afternoon and give Windbird a proper greeting as she arrived in her home for the winter months. Jed returned home tonight from his week in Norway and England, and I know the boys are elated to have two parents again. Tonight we talked to Justin, Jo, and Ziggy. They are settling into their new home. We talked on Skype and had passable video, so Justin took us on a little tour of the house and Ziggy exclaimed that he loves his new home. We can’t wait to visit at Christmas. And after talking to JJ&Z, Howard and Judy Wang of Laleia called on Skype. We were with them in Grenada in March. Since then they have spent three months in Peru, some time back in California, and are now back in Grenada working on the boat. It was great to catch up with them And then Alan and Helaine Kanegsberg, our good friends in Concord, NH, called. We are having some difficulties with our internet connection here which is a bummer, but we are using our telephone as the connection. Tomorrow we will check to see if the marina has internet that might give us a better connection. Most of today was spent just catching up on correspondence and continuing the never ending task of getting our Year 1 logs in the same format as the other five years. And because I skipped a log very early in the year, I have to renumber every log. The work got derailed by computer problems and now it is just finding time to do the work that is the problem. Mark worked at West Marine and this evening we went to the ice arena to see Sam skate. 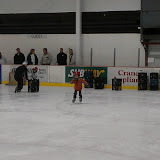 Watching four year-olds ice skating by holding on to milk crates is much more fun that watching an ice hockey game. Jonah says he is going to start skating in January and that should be even more interesting. The weather report is still basically the same as it was last night, so we are tentatively planning on moving Windbird on Tuesday. Things were made a little more difficult today by the addition of big boat that pulled into the slip behind us this morning. We are tied to houseboat that is tied to the dock and we can’t move forward or backward now. Somehow we have to get pulled out sideways before we can back out. Sounds like fun. We heard from our friends Judy and Dave on Freebird today. They put Freebird on the market and then took her to Italy for the winter. A couple from Florida flew over to look at her and bought her. It makes me sad to think of a Freebird without Judy and Dave, but they are looking forward to new adventures. We wish them the best in their new life after sailing. We were always “this bird” and they were “that bird.” I guess now we are the only bird in town. Our whirlwind trip to New Hampshire ended this morning when we arrived back in Falmouth in time for Mark to go to work at West Marine at noon. On the way home we had time to stop at IKEA to get some of the delicious frozen Swedish meatballs they sell there and I picked up a couple of packages of teeny, tiny indoor Christmas lights that are battery operated. These little sets are great for decorating a holiday table. And when we got back to Concord we still had time to take some things to Heather and Jed’s basement. We called the Post Office yesterday and found that we can send forty pounds of books to Ziggy in New Mexico for only $18. So we brought back a big box of children’s books to send to him. But I have to find out the address before I can send them. Justin, Jo, and Ziggy moved from Madrid to Ojo Sarco, New Mexico last week. Ojo Sarco is in the mountains on the way from Santa Fe to Taos. They are renting a home on twenty acres of land and there is grass, trees, and a stream. This is high desert and it is cooler than where they lived south of Santa Fe, but from the photos they posted on Picasa today it looks great. The view of the snow capped mountains that are not too far in the distance is breath taking. From what we can see in the photos, Ziggy has fashioned himself a fishing pole out of a stick and some string and he’s fishing in that little stream. This area is farming country since there is water readily available and Justin and Jo are very excited about being able to grow as much of their food as they can. Congratulations to Justin and Jo for finding such a beautiful spot. We are very excited that we will be spending Christmas with them in their new home. This afternoon life was back to normal. Mark went to work at West Marine and I picked Sam and Jonah up from school. Friday is Pizza Night at the Goldstones, so after nap, we made pizzas. 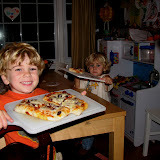 It’s a messy affair, but both boys were very excited about the pizza party. The public radio station where Heather works has just started their fall fund raiser, so she was on the air until 6 pm. Tomorrow morning is Sam’s last soccer game of the fall season and we will meet Heather and boys at the field at 9 am. She has to be on the air from 10 until 1 tomorrow, so we’ll take over child care until she gets home. Jed is still in Europe. I thought he was in France, but Sam insisted today that he is in Norway. Sure enough, when I talked to Heather, she confirmed that Sam was correct. He goes from Norway to England on Monday, presents a paper at a meeting, and then flies home on Tuesday. I guess I had better pay better attention. I don’t like it when a four year-old knows more than I do!